Iraq has begun constructing a fence on its border with Syria to keep Islamic State jihadis from entering its territory, the country’s border guards spokesman revealed Sunday. The new 20-kilometer barrier will include a six-meter-wide trench, surveillance towers, and the use of thermal imaging technology to detect potential Islamists attempting to cross the border. It will run over the border town of Al-Qaim, where Iraqi forces defeated ISIS last November. “If they approve the installations, we will continue along the whole border with Syria,” he explained. “Neither infiltrators nor smugglers nor terrorists will penetrate our borders in the future.” Iraq’s total border with Syria stretches for approximately 600 kilometers. At the height of its power in 2014, ISIS controlled around one-third of Iraq after crossing the border from Syria to attack the Iraqi army. One of the caliphate’s major strongholds was the city of Mosul, reclaimed by Iraqi forces at the end of last year. The U.S.-led international continues to fire missiles against ISIS in its remaining Syrian territories. The border fence is a reminder of the continued threat posed by remaining ISIS jihadists after eight executed hostages were found dead on a way highway north of Iraq. After vowing revenge for the attack, Iraqi Prime Minister Haider al-Abadi responded by ordering the execution 13 ISIS members on death row. Hundreds of people remain in prisons across the country awaiting trial for their involvement with ISIS. Last year alone, 117 people were executed by hanging for terrorist activities, sparking concern among human rights organizations. 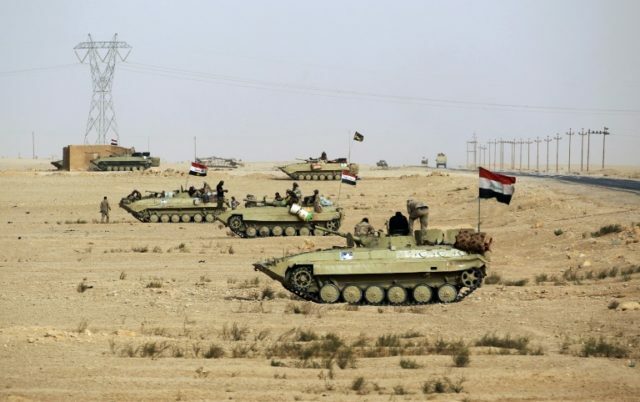 “We had warned that the battle against Daesh was not over, even if the group was broken,” said Abdel Mahdi Karbalai, a representative of Grand Ayatollah Ali al-Sistani, Iraq’s highest Shia Muslim leader, according to Al Jazeera. He also called on the government to start “bolstering the army and intelligence services in order to “eliminate the terrorists and guarantee protection and security” for the Iraqi people.